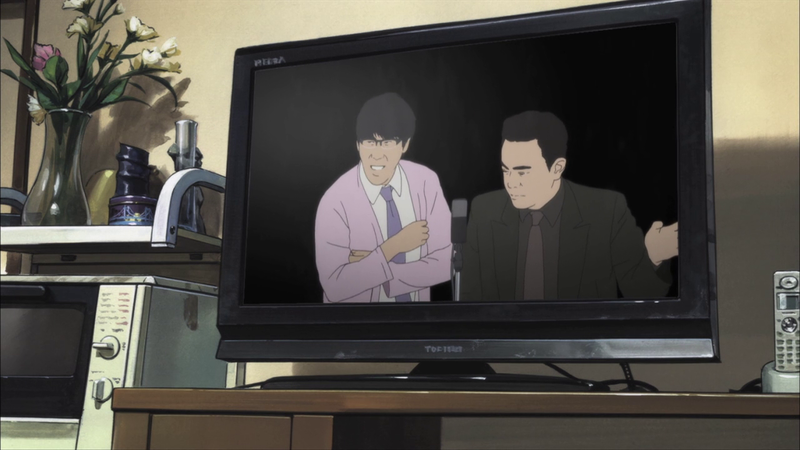 Aku No Hana 11 – The Seconds That Sting | Ambivalence , or is it ambiguity? In this review, I briefly recap the episode and talk about the one scene in the episode that really hit me hard; I am certain that it is not the scene you are thinking of. To put it simply, it has been one month since Saeki went missing. 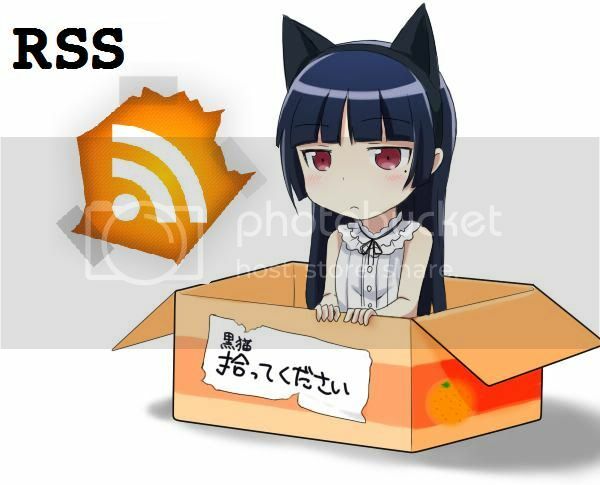 No-one seems to know why she went missing, or the truth of it, so no-one knows of Kasuga’s involvement. Being confronted by Saeki’s friend, Kasuga breaks up with Saeki after a month of silence. He comes to an epiphany when he sees Nakamura in a field of flowers from Les Fleurs Du Mal – he realises the reason behind Nakamura’s feelings, and his fault in leaving her alone: before Kasuga, she was alone; now she is again. It’s surprising how far we’ve come since the aniblogosphere’s main impression of Aku no Hana was “Potato: The Anime”. 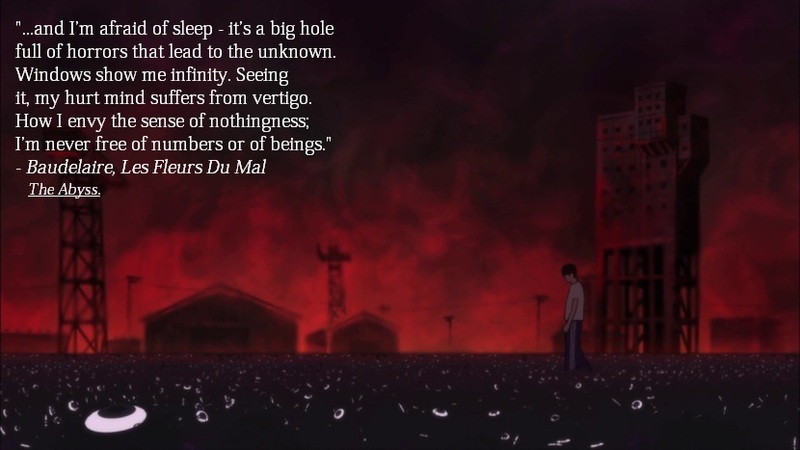 From a show simply lampooned for its atypical choice of rotoscoping and its abandonment of the original manga’s moe character designs, Aku no Hana really hits close to its main audience through creating scenes in which, as far removed from reality as they seem, draw sympathy and empathy from the audience. In the previous episode, Kasuga screams to the heavens that he was an empty shell – in a way, yet another “wall” of his has been broken. He comes one step closer to understanding his true self in admitting that he, too, has been deceiving himself: he seeks to be like his idol, Baudelaire, arguably a brilliant deviant despised by society, because he didn’t want to be an ’empty shell’. In a sense, he seems to be doing things solely because he is told to: even the dramatic classroom scene from Episode 7 was triggered much in part by Nakamura. He appears to want to be a literati, a normal person to his “angel” Saeki, yet he wants to be a deviant, or behaves like one, to his idols Baudelaire and to some extent, Nakamura. Simply put, he does not understand the reasons behind what he does. He is a living mass of existential angst and confusion. AKA he is a teenager. Even his confession to Saeki about how he wasn’t ready to face a “flesh and blood copy” of his “angel” is pretty understandable: crushes in highschool are common, but who dares to face them? The themes in this show, as far removed from reality as they seem to be presented, are in actuality all easy to understand. Social anxiety, angst, growing up, and more, Aku no Hana seems to be the bildungsroman for the modern age. The final scene was excellent too. As much as he behaves as a deviant, his reaction upon realising that he ‘hurt’ Nakamura seem pretty common, almost painfully generic if it were any other anime, yet strangely apt for this show. 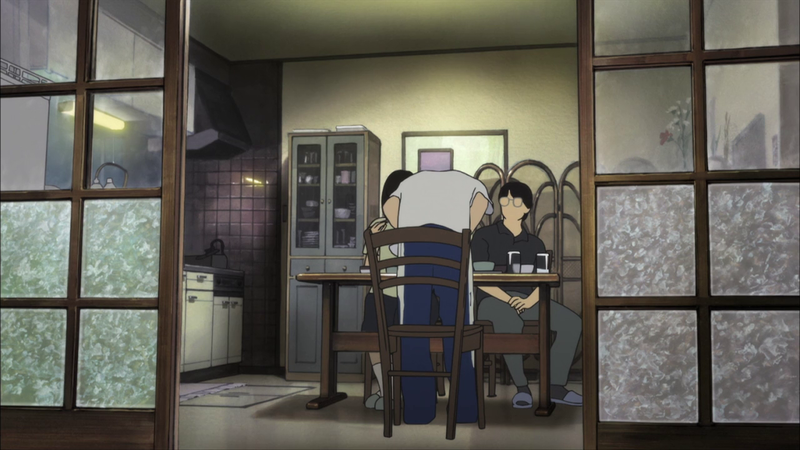 Speaking of strangely apt things, one scene that really hit me this episode was not the dream scene, or even the break-up scene, but in fact, it was the scene in which Kasuga was eating dinner with his parents. Let’s start with the set-up for this scene. The scene is shot from outside the kitchen, leaving the characters involved right in the center, especially Kasuga. While admittedly, the way Kasuga acted while depressed- the slow movements, low voice thing- wasn’t anything particularly new, it was, for me, the seconds that followed afterwards that were particularly poignant. I estimate there were around 10 seconds of Kasuga’s parents continuing what they were doing until his mother breaks down. Contrast this with the way she was behaving when Kasuga was speaking. While the dad seemed occupied with the television, yet still talked to Kasuga, she continued eating her meal, as if with relish: it is until he leaves does she stop, and only after a long time does she show emotion. Hence the way she is presented is reinforced with what happened previously: aside from being a self-blaming emotional wreck, she still finds it somehow important to preserve dignity in front of her son: by acting nonchalant, as if nothing had happened, it was her way of coping. In the seconds that followed afterwards, it was as if they both knew what had happened, and what would happen. Even though I felt that Kasuga’s way of acting wasn’t new, his choice of words was what really made the scene even stronger: even after an entire month, during which the parents have likely pretended that nothing had happened, Kasuga is still wracked with this sense of guilt that continues to plague him: he is “sorry”, “very sorry”. He is sorry to his parents, he is sorry to Saeki, he is sorry to himself, and he soon finds himself sorry, too, to Nakamura. It is as though he had been wracked with a lifetime of unpaid debts – that “all one’s life one pays”. Perhaps the choice of the TV programme lent itself to the mood as well. Two comedians doing rapidfire standup comedy, their jokes indistinct, meshing into the background as Kasuga talks, like noise. Their chattering creates this effect in which the scene is somehow in reality, yet lends this discordant effect to the scene. Kasuga is arguably the only one really talking, yet it is still a conversation. Ideas and messages exchanged, emotions evoked, tears shed. The way the scene opens and ends – with a cut of the television, with its inane comedy, seems to be a metaphor for these character’s lives, and perhaps our own- the way the characters do what they do, and the same for us all: isn’t it all very funny? This entry was posted in Reviews and tagged aku no hana, Anime, Reviews. Bookmark the permalink.